A system to let your autonomous car take the road less traveled. The phrase “country living” might not inspire visions of high-tech transportation. But that could soon change, thanks to a new autonomous navigation system developed by researchers at MIT’s Computer Science and Artificial Intelligence Laboratory (CSAIL). Today, most autonomous vehicles (AVs) rely on highly-detailed 3D maps to navigate roads. Creating these maps requires a serious commitment of time and money, so most AV manufacturers have so far stuck to mapping the lowest-hanging fruit: well-lit, clearly-marked roads. So rural areas that have fewer of these kinds of roads could be among the last to benefit from AVs, even if they might be among the communities that need them the most. Now, CSAIL researchers have developed MapLite, a system that lets AVs safely navigate unmapped roads. They plan to present their project at the International Conference on Robotics and Automation (ICRA) later this month. Instead of relying on 3D maps, a vehicle equipped with MapLite uses a combination of GPS data and sensors to navigate roads. The GPS gives the system a basic idea of the vehicle’s location, while the sensors let it “see” the area around the car, determining likely road edges based on the assumption that the road is flatter than the surrounding area. Using the MapLite system, an AV has a “final navigation goal” (for example, a grocery store across town), but also an ever-evolving “local navigation goal.” This latter goal is always within view of the car’s sensors, so it might be a spot just ahead on the road or an upcoming intersection. The car figures out the best way to reach its local goal, then sets a new local goal. It’s like the old adage about the best way to eat an elephant (one bite at a time). As Teddy Ort, a CSAIL graduate student who served as lead author on a related paper, said in a press release, researchers previously had difficulty creating a “map-less” AV navigation system as accurate and reliable as one using 3D maps. MapLite’s combination of GPS data and sensors is a unique approach to the issue. And it seems like it works. When the CSAIL team equipped a Toyota Prius with MapLite, the AV successfully navigated multiple unpaved country roads in a sparsely-populated Massachusetts town — the kind unlikely to be one of the first mapped by AV manufacturers. “A system like this that can navigate just with on-board sensors shows the potential of self-driving cars being able to actually handle roads beyond the small number that tech companies have mapped,” Ort said in the press release. 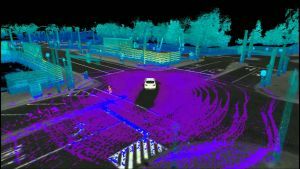 Ultimately, Ort thinks some combination of 3D maps and MapLite might be the best way for AVs to navigate — 3D maps in urban areas, and a system like MapLite for unmapped roads. If that’s the case, the sight of an AV on a dusty country road might not be all that uncommon sometime in the near future.